I can’t let 1997 draw to a close without noting that it was the year that Bob Dylan (or his people, to be more precise) launched BobDylan.com. I have had that website open as one of my the tabs in my browser every single day of 2014 so far, and I can’t imagine that I will close it before this project has wrapped up – it is an indispensable, if sometimes frustrating, resource. 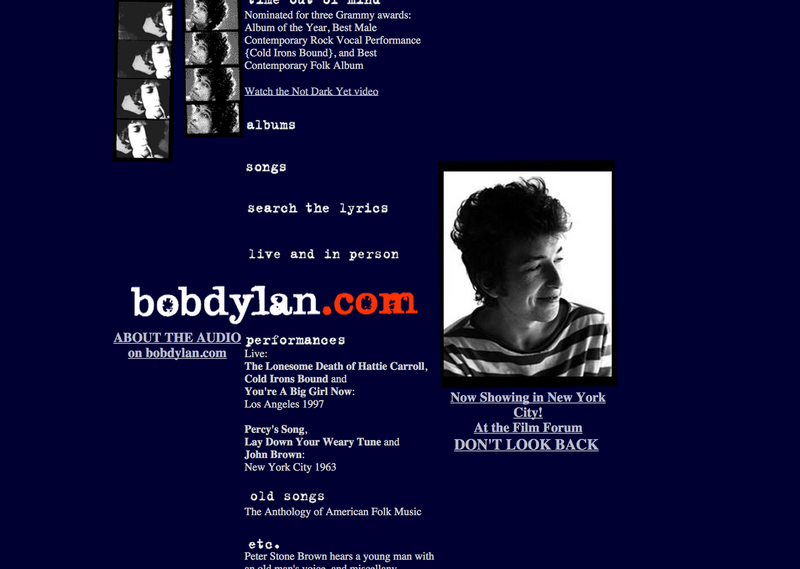 The 2014 version of BobDylan.com has six main parts, only a few of which are genuinely useful. The News section, for instance, currently lists absolutely no news – it’s essentially a dead link. There is plenty of Dylan news – new album coming out, new US tour – but this is not where you will find that information. The News Archive is only slightly better. Strangely, every once in a while the site will accidentally reset its news archive and roll out news that is a few years old. No idea why. Hype is an area that is barely used – only once in the entire year so far. The second section, Music, is the one that I use on an almost daily basis. You can sort by Album and by Song, searching by lyrics and so on. Every time I cut and paste Dylan lyrics, I do so from this site – even though it is occasionally wrong (i.e. for the songs on Pat Garrett and Billy the Kid). 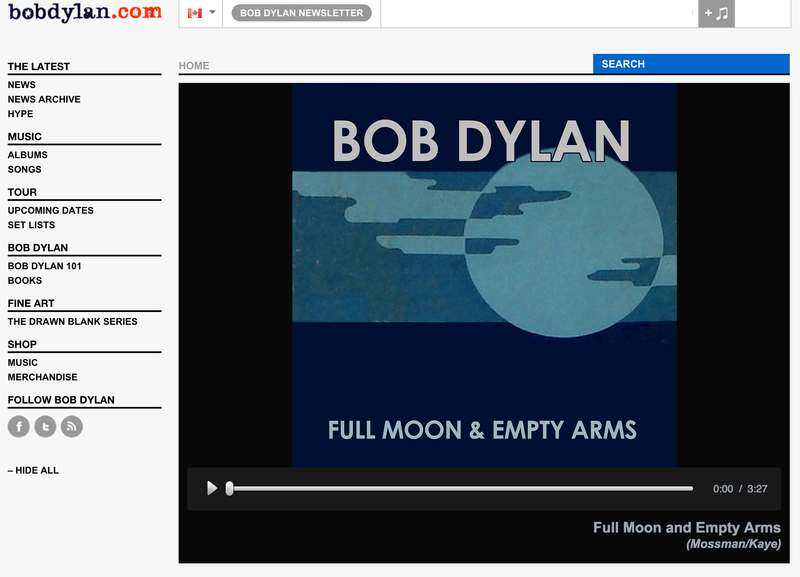 You can also click on a tab that will give you a list of every time Dylan has played any given song – that is incredibly awesome. 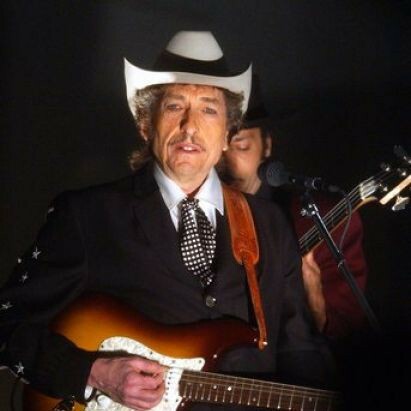 I can imagine someday in the future where we’ll then be able to click on the performance and hear that version – they’re almost all out there digitally – but that will be long after Dylan is gone, if ever. The Tour section is helpful – I got tickets through it for his upcoming show in Cleveland – the set lists is similarly helpful. They are updated extremely promptly. In cases of discrepancy between this and Bjorner, I usually credit Bjorner – super-fans are super-fans for a reason. Bob Dylan 101 and Books are sort of dead ends. The Fine Art section leads to sales of his prints, which I don’t care for that much. The Shop section is remarkably bad, actually. I did buy a Rolling Thunder Revue shirt through the Shop (good quality cotton too, comfortable shirt! ), but that’s about it. 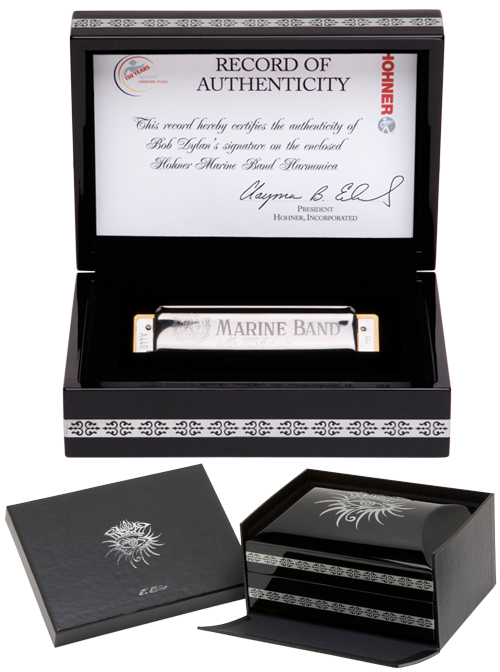 If people want to take up a collection and buy me the “Individually Hand Signed Harp in a Carved Ebony Box” for $5,000, I’ll take it, even if I’d prefer it in G.
The internet wayback machine helpfully provides us with a glimpse of the way the site used to look. This is from January 1998, which is the earliest image available. Remember when the web used to look like this? Dylan seems to have embraced the internet earlier than a lot of other musicians, making a lot of material available from the site for a long time. In 1997 we were all still on dial-up, so downloading a whole song was a major undertaking. He was well ahead of the game at the time, but in a lot of ways the site could probably use an overhaul (certainly in the hype department). This year I have gotten so used to the site, that I am still thrilled when it changes in a big way, as when “Full Moon and Empty Arms” debuted. One thing that I’ve noted this year, though, is that I am not the type who ever otherwise goes to the sites of musicians that I like unless someone sends me there directly. I don’t have that kind of relationship to music anymore – I guess with the exception of Dylan.